Come to any of our tastings where our staff will be happy to have you experience the taste of our vodkas and coolers. 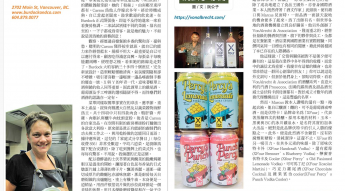 Our Chef Marcus was featured on the March edition of The Epoch Times, visit their Měishí tiāntáng (Gourmet Paradise) page! In a glass half-full world, Chef Marcus Von Albrecht has been playing with his food for a lifetime. By the age of four, he was running his own imaginary restaurant. Kitchen skills are good life skills. However many decades later, his mother’s wisdom holds true—and brings plenty of smiling faces to the tasting table….